Now for a few FREEBIES for everyone! I actually think having a writing rubric posted is a good thing....just not the one the actual one they provide for us to post. The kids do not even notice it. At all. They have no idea what it is. Even after we talk about it. Typed text in columns is meaningless to 2nd graders. So, this year I decided to turn it into a visual rubric that students COULD understand and use. Here's a picture of it posted in our classroom. If you would like to use this visual (based on our SC state writing rubric) in your classroom, just click the picture above to download your copy!! We've also added a couple of new freebies to our TpT shop so if you haven't snagged those yet, you might want to drop by and pick them up. If you do, we'd love for you to leave some feedback on them. Hope you can use them! In our classroom, we're currently working on our Matter Unit and this game is a great way to practice identifying solids, liquids, and gases! Click below to download it for FREE! 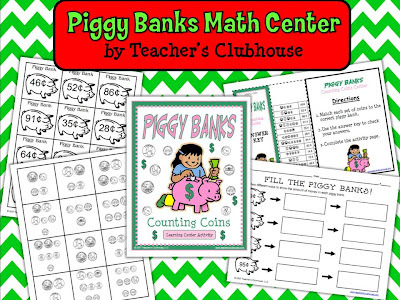 We're also working on Money so I wanted to share this Piggy Banks Math Learning Center FREEBIE! Just click the image to access it....and leave some love if you like it! If you like the layout of this center, you can check out our entire Math Learning Centers Unit or our Grammar Learning Centers Unit. Love, love, love those freebies!!! 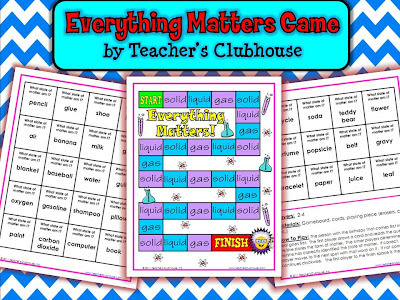 I can totally use that rubric and the Everything Matters game!! AND GUESS WHAT!! I fixed my no-reply blogger problem, whoop whoop!!!!! Haha I just had to tell you! Thanks for all the freebies! Even though I teach fourth, they can definitely be used there! Thanks so much for sharing these. I can't wait to try the matter game. Hi Amanda! Thanks so much for the freebies! I love the pizza rubric! It really makes a difference when they can see what your expectations are! By the way, I loved your post on your Maroon 5 concert! I was so jealous! I just bought tickets to see him in October here in California. For now...I just get my fix of Mr. Levine on The Voice every Monday and Tuesday!! Have a great evening! Thanks so much for sharing! I will definitely be using the writing rubric. I love your rubric! It is so visual. We use something similar but it is a hamburger instead of a pizza. Thank you for all of these freebies :) That visual rubric is a great idea!! YOUR BLOG ROCKS THE HANDS RIGHT OFF THE CLOCK!!! THANK YOU! Stop by anytime! Love these rubrics! I changed grade levels this year to second grade and the first thing I did was to find your website! I found it years ago and would take what I could and apply to the grade I had then. Now I am actually in second and I am so thankful to have you as a place to go for ideas and help. Your students are very lucky to have such a creative and innovative teacher. Keep the great ideas coming! Just downloaded a couple of your freebies. What fun! I'm really looking forward to trying them in my class this year. Thanks for posting such wonderful ideas.